I wasn't really enthusiastic about the first book, A Grimm Legacy in this series, but since I already had an ARC for the second book in the series, I wanted to give this book a chance. Unfortunately it suffered from the same problems as the first book. Reading them almost back to back probably didn't help, as near the end I was quite fed up with the story, even though these are relatively short books. I still liked the idea of mashing up all the fairy tales and introducing readers to lesser known fairy tales, but that's about it. I still didn't care for the characters, or the plot, really. They felt very interchangeable. There's a bit more world building, but not enough to answer the questions I had. The writing isn't that good either, or at least it wasn't a style I particularly liked. I think some people might enjoy this series as 'snackbooks'* but for me it wasn't working. Any more books in this series, I think I will pass on them. 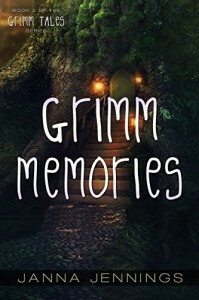 Grimm Memories is the second book in the Grimm Tales series. The first book in A Grimm Legacy.